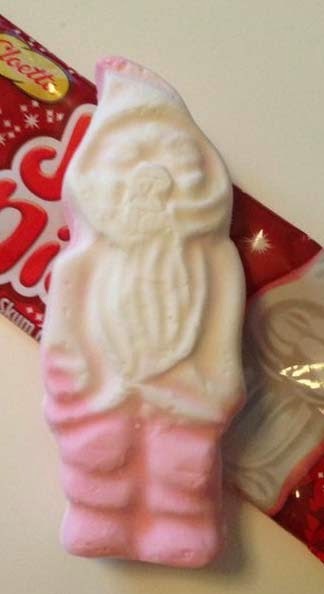 Julenisse, meaning little Santa or Santa's little helper in Swedish, is a marshmallow figure which tastes of strawberry. Only sold from September to December. It has a strong and fruity strawberry smell and the taste is also very strawberry. Even though it's artificial it's quite good and I'm sensitive to unnatural flavours. The marshmallow is chewier than the American kind and I like this texture better. There is some sugar dust on top, which is a bit odd though. It's the same kind of candy like these Juleskum but Julenisse is individual wrapped and bigger, which fits these marshmallows better because one is enough in my opinion.